Once you reach 5,000 honor, you'll be given the option to join The Arena. You can only achieve at most 5,000 honor from regular multiplayer attacks. Achieving more than 5,000 honor can only be done in The Arena. If you drop below 4,750 honor, you'll be removed from The Arena. 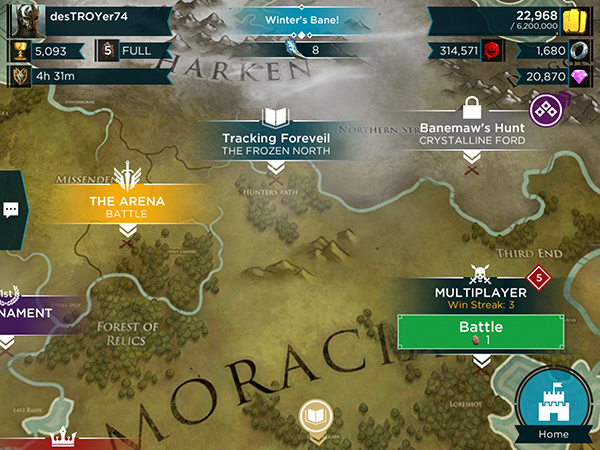 To enter the Arena, you click on "The Arena" battle map indicator, or "The Arena" from the menu. Gold and Rings will be awarded for defeating your Rivals in The Arena based on the difficulty of the opponent. You can still do regular Multiplayer attacks after you've entered The Arena. You can loot gold and win rings in regular multiplayer, however you won't be able to win honor. Attacks made against you by other players in multiplayer can raid your gold, but only while your Gold Shield is inactive. No honor will be removed from multiplayer attacks. More information about gold shields can be found below. Gold Shield: Players can lose up to X% of gold. Once they’ve lost that X%, their Gold is Shielded from Arena for a period of time. Minimum Gold: Attacking players that encounter a base with a Gold Shield are able to loot a randomized minimum amount of gold. Winning or losing Arena battles does not affect your win streak in regular multiplayer attacks. Tap "The Arena" battle indicator from the map (or from the menu). You'll be given the option to attack up to 3 different bases. The difficulty will be based on the enemies position on the leaderboard. You'll see a 3 minute timer, if you do not start an attack within that time frame, you'll be matched with up to 3 different bases again. The EASY battle costs 1 Battle Stone to attack - LOW/HIGH honor gained/lost. The MEDIUM battle costs 1 Battle Stone to attack - MEDIUM/MEDIUM honor gained/lost. The HARD battle costs 1 Battle Stone to attack - HIGH/LOW honor gained/lost. 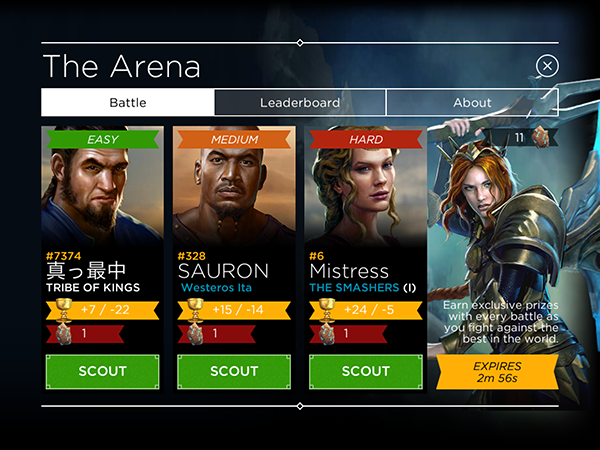 The Arena matchmaking is based on Arena leaderboard honor, not the difficulty of the base. "HARD" is typically the top 1% in the leaderboard, hence they will be the hardest bases to find (bases higher than your honor level). "MEDIUM" bases might be around the top 5-25% (bases around your own honor level). "EASY" bases may be around the bottom 25-100% of the Arena leaderboard (bases lower than your honor level, as low as 4,750 honor). The higher your honor, the harder it will become to find a "HARD" base. The above percentages are still relative to your own honor level. There is no limit to the number of times your base can be attacked in The Arena. The higher your honor, the more likely your base will be seen. 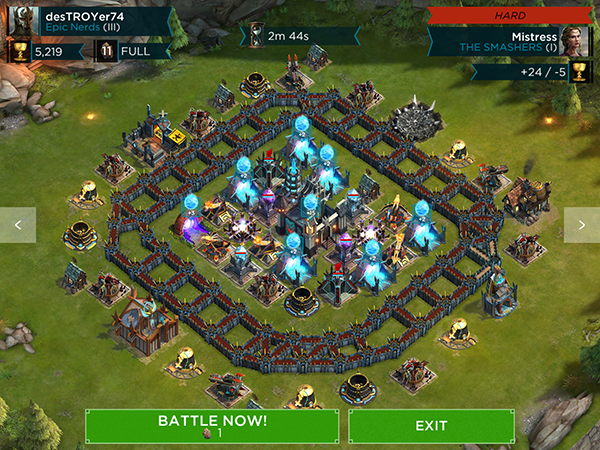 You can scout each of the bases before deciding which one to attack. When you're inspecting the enemy base, you can press the left and right arrows on the side to toggle between the 3 bases. 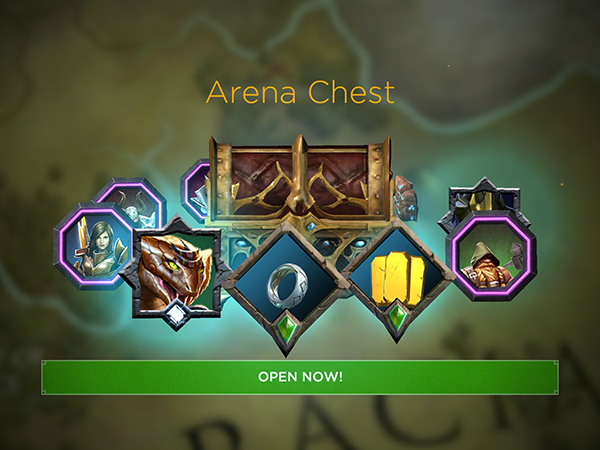 After every victorious Arena battle, you'll be presented with an Arena Chest. The Arena Chest contains 2 exclusive ancients: Zillah and Golgogg. Each attack made in The Arena will offer a fixed amount of Rings based upon your current honor level, and the difficulty of the opponent. Arena players will receive Season Points based on their Honor band at 4 specific points in the day. At the end of a Season, players will receive rewards based on their rank in the Season Points leaderboard. At the end of a season, points reset to 0. Those outside of the top 3 will receive Season Points based on their Honor.